Coincident with a theme I touched on in my debate yesterday with Scott Ritter, Austin Bay at Real Clear Politics posts an analysis reflecting on Al-Qaida's Emerging Defeat. The January 2005 Iraqi election succeeded, giving terrorists and tyrants a disturbing "purple finger" -- the very public ink stains marking the fingers of Iraqi voters. That election was an incremental success, but one of many. This week's publicized call for a more "normalized" U.S.-Iraq relationship is another indication that the incremental successes are accumulating. Every increment can become a decrement, but war is a dynamic process -- and from a historical perspective the dynamic direction in Iraq has favored the United States -- in other words, the big trend suggests an emerging success. I know, that runs counter to Senate Majority Leader Harry Reid's April 2007 declaration that the United States "lost" in Iraq, but it was Reid's choice to make himself a sad historical footnote. This emerging success required lots of money and unfortunately involved lots of blood. I had another document on my Baghdad desk, Musab al-Zarqawi's February 2004 letter to al-Qaida's leaders, in which he lamented al-Qaida's looming defeat. He also described his counter-strategy: a Shia-Sunni sectarian war. That's war's hideous dynamic, effort met by effort -- with death, pain and suffering in each terrible collision. Zarqawi's murderers did their best to incite a sectarian debacle. Oh, they got headlines, they enlisted a motley array of criminal allies, they set Iraq's democratic timetable back 12 to 24 months -- but they failed. I’ve been trying all week to catch up with an excellent piece on Monday, written by Evan Coyne Maloney. Maloney goes on a riff over a classic Mark Steyn piece on “silent surrender,” the price posturing artists and other intelligentsia of the Left pay in homage and abeyance to the cult of multiculturalism. The dogma of multiculturalism holds that all cultures are equal, except Western culture, which (unlike every other society on the planet) has a history of oppression and war is therefore worse. All religions are equal, except Christianity, which informed the beliefs of the capitalist bloodsuckers who founded America and is therefore worse. All races are equal, except Caucasians, who long ago went into business with black slave traders in Africa, and therefore they are worse. The genders, too, are equal, except for those paternalistic males, who with their testosterone and aggression have made this planet a polluted living hell, and therefore they are worse. Once you understand this, the Multicultural Pyramid of Oppression, you can begin to understand how to turn to your advantage certain circumstances that are beyond your control: such as where you were born, the type of genitalia you were born with, into what race you were born, and the religion of your parents. You see, the fewer things you have in common with The Oppressors, the more you can cast yourself as The Victim. And as The Victim, you are virtuous, so there are certain things you can get away with that others can’t: like actually oppressing people. As racist as anything the Klan ever claimed, this implicit dogma of the Moral Supremacy of the Oppressed. Consider what happens when you apply this thinking on a societal level: if we convince ourselves that all of the blame for the current state of the world should be placed at the feet of Western civilization, then why would any Westerner think that our civilization is worth fighting for? Or even worth saving? The rules of Multicultural Hierarchy require us to preemptively surrender, because any crime committed against us by a more worthy Victim is somehow deserved. And if we deserve it, then fighting against what we deserve amounts to fighting the administration of justice. Well, if we deserved it then—and still do now—then what business do we have defending ourselves? Who are we to stand in the way of justice? The only bright spot I can see is that, much like the Roe effect that challenges the Left in the US, strict Western adherents of multiculturalism are more and more opting for self termination, rather than procreation. Maloney reminded me of some pop cultural refuse that informs the topic, I think. for that's the only painless feat. Unfortunately, their own ideologies deny them any relief in an afterlife, and they continue to laugh to scorn those who believe in things eternal. The format allowed each of us 10 minutes to present our views on the three topics in turn, followed by student questions. I started. I used a brief outline, Ritter appeared to speak extemporaneously. Students and an adult or two asked questions, and towards the end the teacher who organizes the sessions augmented with questions of his own. Most allowed both of us to respond, but most were primarily directed at Ritter, but he was often offered to let me lead in response and I always had an opportunity to rebut or otherwise offer my own response. My first impression of Ritter was of a very professional and courteous, even likeable man. His military background is evident. He was very respectful during the entire exchange, and had researched me at least as thoroughly as I researched him. Ritter centered his 10 minutes on the premise that the US signed international treaties, that those treaties take on the force of law, that he “swore an oath” to defend and support the constitution (he made very forceful declarations along these lines often). He quoted UN Charter, explained the prescribed military actions that the UN holds member countries can take that would be “legal” and “lawful.” He placed the entire issue of us going to war (previously in Iraq or in future in Iran or elsewhere) completely in the context of international treaty, UN mandate, with only cursory mention of the US Constitution or US war powers and authority. I later challenged that formulation on the basis of US national sovereignty, and that the US can never sign a treaty that can abridge rights and powers granted by the Constitution (surely he can’t be enforced, either, without loss of national sovereignty. Ritter then seemed to reorient his line of reasoning to address what he felt were the unconstitutional aspects of our military actions in Iraq (and even Afghanistan). I highlighted that for several decades, and all modern wars (since WWII), all three branches of Government have been complicit in allowing Congress to abrogate its Constitutional obligations to declare war (War Powers Act), Congressional authorizations for Presidential use of military force, etc. Hold Congress to its obligations, I’d agree, but to allow Congress to then escape responsibility and only blame the President is allowing those complicit to evade responsibility twice: first in the votes to authorize, then second in turning around and blaming the President with the results, as if they were innocent bystanders. Ritter obviously tailored what might have been a different, more strident kind of presentation, were he not before a student audience. It really was a good, vigorous debate. He knows his UN Charter, for sure, perhaps more than he knows his Constitution, but he knows better than I, though I’m certain he cherry picks from the US defining documents. He is quite passionate and forceful, makes effective argument, and it’s hard to argue against his resume. I’m glad I didn’t. Despite his later claims to cherish US Sovereignty (“we don’t need the UN or other international problems to fix things we did ourselves, the American people can do that ourselves”), Rittre clearly buys in to the whole UN as final arbiter for Right and Wrong and international law. I responded by describing UN involvement in wars, peacekeeping as absolute disasters that usually make matters worse: UN corruption, violence, criminal activities, other malfeasance. He made the claim that we made Al Qaeda stronger, that we haven’t beaten them anywhere, that we discredited ourselves and our ideals by our actions. He responded to questions about Guantanamo, torture, Geneva Conventions, and our standing legally, internationally, in harsh terms. Illegal, immoral, and he would immediately close Gitmo and prosecute anyone guilty of torture. I also said there’s one place that we actually DID defeat Al Qaeda: Iraq. We have decimated them there, handed their hats to them, and they have suffered a terrible public relations and psychological defeat – which is the only plane on which they could ever be successful. Our military might, coupled with Iraqi resolve and citizen rejection of their foreign terrorists – smashed Al Qaeda. So much for their invincibility. I found myself time and again returning to the context of decisions, viewing decisions in light of potential, known and unknown threats. I stressed repeatedly that we are already at war, were already at war, and that our enemies used (and use) terror proxies to do what they can’t or won’t do explicitly, openly, with their military forces. State sponsors of terror, in many ways, are more dangerous than the minions they fund, sponsor, host, hide, and direct. Safe havens should be of great concern, and nuclear and other WMD proliferation is a grave threat. Just based on a search I did yesterday, Ritter appeared less than 2 months ago in a college forum in Syracuse. He had appeared in a couple of forums hosted by the local public television station. As he arrived today, Ritter stated that he had earlier that day appeared at a similar forum, likewise sponsored by the local PBS affiliate. He told me that such forums often consist entirely of like-minded speakers, rather than people with contrasting views. John Stossel, writing at Real Clear Politics, marks tomorrow’s US observance of Thanksgiving with a little known and less remarked lesson from the first Thanksgiving Day. Call it the New World’s first object lesson in the innate and inevitable failure of communalism. Stossel recounts Pilgrim history not found nor mentioned in today’s heavily socialized public school curricula. Most of us remember Pilgrim stories, about how the first European settlers nearly starved themselves out of existence those first two years. Many of us were either taught overtly or surmised that only by the intervention and instruction of big hearted and ecologically grounded natives did the Pilgrims find their footing, and survive. Most Americans of any age share a stereotypic and cartoonish view of (all) Native American cultures as quintessentially communalist: they all hunt together, roam together, eat and live together, in tightly connected family, clan and tribal alignments. Thanks to primary sources left behind by the Pilgrims, we can know that attempts at sharing labor and the fruits of that labor in the settlement had failed. Two years of collective farming and resource sharing brought them famine and want. Immediate introduction of privatized farming led to plenty and sufficiency. However much the Pilgrims learned from their native hosts, they learned something very different from their own social experiment. In contrast perhaps to their native American hosts, white European settlers tended to take advantage of communal social solutions. They could not be trusted with a kind of “from each according to their abilities, to each according to their needs.” Folks wouldn’t work up to the capacity of their abilities, when the fruits of that capacity would not be theirs to enjoy. We can learn something of vital importance in an age of increasing advocacy for communitarian social solutions. What Plymouth suffered under communalism was what economists today call the tragedy of the commons. But the problem has been known since ancient Greece. As Aristotle noted, "That which is common to the greatest number has the least care bestowed upon it." When action is divorced from consequences, no one is happy with the ultimate outcome. If individuals can take from a common pot regardless of how much they put in it, each person has an incentive to be a free rider, to do as little as possible and take as much as possible because what one fails to take will be taken by someone else. Soon, the pot is empty and will not be refilled -- a bad situation even for the earlier takers. What private property does -- as the Pilgrims discovered -- is connect effort to reward, creating an incentive for people to produce far more. Then, if there's a free market, people will trade their surpluses to others for the things they lack. Mutual exchange for mutual benefit makes the community richer. Life is about consequences. Learning is mentally tying the appropriate consequence to individual actions. Prosperity and happiness, most often, results from altering behavior to elicit positive consequences and avoiding negative ones. That’s an insight that can yield much for which to be thankful. AJ Strata continues his commentary on remarkable events in Iraq. Earlier this week, he posed the question of whether we can properly stop saying we’re winning in Iraq, but can rightly say, “we’ve won.” His latest post points to more evidence that this may be so. Strata begins by noting what by now are widely reported declines in violence: against civilians, against US armed forces, in previously hostile areas outside and even more remarkably, dangerous areas inside Baghdad itself. Strata adds that military operations, civilian tips, and captured personnel and documents are leading to a huge increase in killed or captured terrorists, and the number of arms and weapons caches seized. In recent months, as evidence of the success of the “surge” mounted, war critics have pointed to what they allege has been a diaspora of Iraqis, professionals in particular, largely Sunni, fleeing the dangers of today’s Iraq. Most recently, these same critics have suggested that, without clear evidence that many of these Iraqi refugees were returning, any latter day Iraq would be crippled by what amounted to real and de facto ethnic cleansing. These same critics may be running out of “yes, but” caveats and constraints at surrendering to ever-apparent victory: Iraqis are returning. The figures are hard to estimate precisely but the process could involve hundreds of thousands of people. The numbers are certainly large enough, as we report today, for a mass convoy to be planned next week as Iraqis who had opted for exile in Syria return to their homeland. It is one of the most striking signs that not only has violence in Baghdad and adjacent provinces decreased dramatically in recent months, but confidence in the economic and political future of Iraq has risen sharply. Nor is this movement the action of men and women who could easily reverse course and turn back again. Tighter visa restrictions imposed by Damascus mean that those who are returning to Iraq cannot assume that they could quickly retreat again to Syria if that suited them. This is, for many, a one-way decision. It represents a vote of confidence in Iraq. Why are hundreds of thousands of Iraqis, many with Baathist ties and one would assume some power and money, be streaming back into Iraq all of a sudden? What signal was given through the tribal or sectarian grapevine things in Iraq were quieting down enough to bring families home and to start their lives up again? These people may be looking at the sea of news stories coming out of Iraq on the progress. But given this mass exodus from Syria I would gather much more is at work here. But whatever the reason, we now see three major indicators the war on Iraq is ending. We see huge drops offs in violence, violence now laid solely at the feet of al-Qaeda. Every bomb that kills Iraqi Muslims is now an attack from al-Qaeda. No one is being duped by the liberal media spin this is the fault of America. We see large numbers of dead and captured terrorists. The rest are fleeing. From the terrorist cells we find we gain a wealth of intel which leads us to more terrorists, weapons and intel. We see a wave of concerned citizens leading us to the terrorists and their caches. We see the ever increasing amounts of weapons being seized and destroyed. And now we see this massive migration of Iraqis coming home. These are not the signs of an endless war, an endless quagmire. These are the signs of a conflict ending. And they are all pointing to a huge US-Iraqi victory and a stunning defeat for Bin Laden’s Butchers. Growing optimism. The people with a real stake in victory, their very lives at risk if they wager wrong, are voting, yet again, for the miracle that is modern, may the name and memory of the hated Tyrant not be uttered, post liberation Iraq. Wait for it. When the Clintons start reminding voters that Hillary voted for us to go into Iraq, you’ll know we won, for sure. Contrary to the myths of the left, peace can only be built over the corpses of evil men. God is surely good, but God is more surely God, whatever else we think He may be. I am often pleasantly surprised by the pathways readers travel to find my blog through internet searches. I get a lot of hits on An NCO Induction, probably by unit non-commissioned officers (NCOs) trying to find ideas on how to conduct one. I get a lot of hits from people wanting to find the story behind the hymn It is Well (With My Soul). It is a great story, if you’re not familiar with it. Linking to hymns and songs must build traffic, as many people want to know the lyrics to a song playing in their head. I recently got a lot of hits on An Iraqi Dust Storm. Who knows? Maybe they wanted ideas for alliteration on current events. But the one hit I seem to get most often is from A Letter to My Son. I haven’t revisited that post since writing it. It seems like I see a search on that topic at least once every day. I think there are a lot of Fathers trying to find a way to say something important to their children. In my case, this letter was one I wrote in Iraq, in answer to questions Little Manly was asking Mrs. Manly while I was away. It seemed a good and right time to tell my son how it was that I came to believe in God, and call Him by name. Little Manly was asking about God, how you can know He exists, why sometimes He works in ways difficult or impossible for us to understand. I explained how I went from being an Atheist, not only not believing but in many ways defiantly rejecting the idea of God, to tentative trust in a Higher Power, to believing in God, to coming to a place where I accepted who He is and what He offered to me. If you need a little encouragement to think about God, maybe a little prompting to consider Him at His word, I’d offer that you read the whole thing. As I look forward to Thanksgiving, I think it an excellent time to revisit what I believe, what I told my son, what I am most thankful for. I am so similarly thankful for the God I’ve come to know, and His gifts to me I’ve come to cherish, that I sometimes lose sight of which came first. But of course I know the truthful answer to that, and so I Praise God, from Whom all blessings flow. Here’s an excerpt from that letter. Let me tell you why I believe in God, because once upon a time I did not believe in Him. I did not think He was real, I thought this was the only world there was, that there was no such things as heaven (or hell). I believed that each person only exists for just the amount of time they breathe and walk the earth, and when they die, they die and their bones turn to dust and they become just bits of matter. Eternity just meant longer than human beings can imagine, but nothing more than that. My life changed, most importantly. And that has made all the difference in the world, all the difference in my world. So before I believed anything, I very much wanted to believe, because the alternative is to have no hope for something better. How Did I Come To Believe? In the process of me learning about myself, and my family, and dealing with people and problems, I came to believe that there was a Power greater than me who could help me, who wanted to help me, who had always been and always would be a part of the world He created. How did I come to that? I’m not really sure, but it happened. It made me want to find out more about this idea of “God,” and the only place I could think of to find out more were other people – asking them what they thought – and the Bible. (That’s supposed to be full of God’s words, right?) So I talked to a lot of people, friends, family, people I trusted, and I started reading the Bible. I got far enough to start thinking there had to be something to what the Bible said, I mean Jewish people followed God for at least 2,000 years before Jesus was born, and they believed in him despite really terrible things: slavery in Egypt in ancient times, and even the Holocaust in World War II. They never gave up on their God, because they believed He never gave up on them. And the first Christians, the ones who were called Saints, the ones that saw Jesus with their own eyes, and those who knew and met people who DID see Jesus when he walked the Earth, those early believers really believed. Many times, they gave up everything they had for Jesus. They were killed for believing in him. That’s pretty hard to imagine they would do for something made up. One day, I was walking along the frozen Mohawk River and Erie Canal. It was a brilliantly sunny day in January, the kind of day where the sun is so bright, and reflects so strongly off the snow and ice, it hurts your eyes. But it was brilliant, beautiful just the same. As I walked, I started talking to a God I wasn’t even certain was there. I told him I needed Him to help me know that He exists. I told Him I needed to know for myself. I told Him that I couldn’t pretend, wouldn’t pretend something I didn’t know, and He was going to have to convince me. As I walked, He spoke to my heart. He suggested to my mind some questions to ask myself, which He must have given me because they were way different from anything I had been thinking. And I found an answer. In my heart, I know that there are certain things, certain acts, that are absolutely bad or evil. Likewise, I know there are things that happen, things people do, that are absolutely good. Killing someone without necessity, causing harm to someone else for fun, these things I know are evil. Sacrificing your life for someone else, protecting someone who is helpless, saving someone’s life, these are good things. I know these things with complete certainty, without ever having been taught or told this is so. Then it really wouldn’t matter whether I do good or evil. There is no hope, but no punishment either. No law that binds us, no Authority greater than what each of us, in our own selfish desires, decides is good for us. And I wouldn’t care at all what happens to anyone else. And there is NO EXPLANATION for why I would know, deep in my heart, that certain things are evil and bad, and other things are good. Because without God, there is no reason to think abut right and wrong. But, I still do. I have to. I can’t help myself. Because I am His creation, and that’s how He made each one of us. As I listened to what God was causing me to think about this, I became more and more excited as I walked along that frozen emptiness. I was not alone, and I knew it. God was with me that day, and He’s been with me ever since. For that, and blessings He has bestowed on me and my family, I am truly thankful. May the God who created all of us in His image shine His grace into your life, and bring you to the place of gratitude and love. The security improvements in most neighborhoods are real. Days now pass without a car bomb, after a high of 44 in the city in February. The number of bodies appearing on Baghdad’s streets has plummeted to about 5 a day, from as many as 35 eight months ago, and suicide bombings across Iraq fell to 16 in October, half the number of last summer and down sharply from a recent peak of 59 in March, the American military says. As a result, for the first time in nearly two years, people are moving with freedom around much of this city. In more than 50 interviews across Baghdad, it became clear that while there were still no-go zones, more Iraqis now drive between Sunni and Shiite areas for work, shopping or school, a few even after dark. In the most stable neighborhoods of Baghdad, some secular women are also dressing as they wish. Wedding bands are playing in public again, and at a handful of once shuttered liquor stores customers now line up outside in a collective rebuke to religious vigilantes from the Shiite Mahdi Army. Gone are the negatives in the lead, the contrarian framing of the story in editorially favored tones. Sure there’s a slight effort of “sure things are good now, but that may not last,” but the effort is pale and weak, and shrivels in contrast. None of that today. Time for the Gray Lady to yank off her bonnet, hike her skirts, and hustle herself over to a prominent place where she hopes all the new excitement and attention might flow over onto her. No apologies to them what brung her. What a fortunate turn for that other contrarian, Hillary Clinton. By the time she needs to start reminding voters that, in fact, she voted in support of our victory in Iraq, her gal pal the Times will have restored and elevated the Victory narrative. Bloggers and other news outlets across the political spectrum comment on emerging consensus on success in Iraq, whether acknowledged grudgingly like the Times, or as full-throated gloating. I have to say I think we are moving from ‘winning’ in Iraq to ‘won’ in Iraq. As the stories of normalcy returning to Iraqi society continue to come out, there is less and less of a chance al-Qaeda, or one of its sister extremist groups, would even think of starting the bloody attacks again. If al-Qaeda restarts the bloodbath now it will be clear to all it was not due to Americans - it will be the fault and crime of al-Qaeda. I see victory at hand, but I don’t think I would make the claim Strata makes. I don’t doubt for one moment that any upsurge in violence, or a counter-offensive by Al Qaeda, however anemic, would be followed in nanoseconds by a resumption of the war against the war. That said, Strata offers an insightful analysis into why the media, aided and abetted by many thoughtful and well-intentioned analysts who in good faith until recently saw only bad outcomes for our efforts in Iraq. For the war opponents on the Left and in media, Strata sees their failure as one resulting from arrogance. Strata links to Dr. George Friedman at StratFor. Friedman has done some great work assessing the many facets of the war on terror and Iraq, but nevertheless retained a deep pessimism about probable outcomes and end states in Iraq. Strata notes Friedman’s explanation of his reassessment based on the changing (and improving) situation. Actually, the mistake was worse than that. It is the same mistake the news media is making now when claiming there is no reconciliation going on when there is. Reconciliation is being done without laws to mandate. It is being done but in a manner that the far left will not or does not recognize. There is oil revenue sharing and de-facto de-baathification. The Iraqis knew it was needed and are doing it. The arrogance from the West is in the thinking no good can be done without a law to make it happen. So the fact it their premise is wrong because they don’t or can’t see all the forces at work. The Iraqis are coming together in many ways. Laws on books are irrelevant to the actions and changes taking place. If your analysis requires a law on the books to recognize the forces at work in Iraq your analysis is crap. Similarly with StratFor’s analysis, they failed to take into account Iraqi initiative and efforts. They looked to Patraeus’ efforts alone. Patraeus is an opportunist - as all good military and counter-insurgency people are. He would not announce a goal or an effort if it was tenuous - but he would exploit it. The problem many people have had in assessing which way Iraq would is the left too many variables out of the equations. Easy to see but driving variables. Initiative by the Iraqis to accelerate the path to success is the missing piece of many of the analyses I see out there. People naively assume nothing can be done by the Iraqis themselves. Bad assumption. Left to their own devices, people all over the world, throughout history, confound all the experts, the historians and diplomats and reporters and politicos. Give the people, the “little” ones, those in the great silent majority of any community or culture, just enough room to decide for themselves, and they may just surprise the heck out of all of us. One thing the media and many people have stated (including myself) is Iraq would have to be won by the Iraqis themselves. Well folks, the Iraqis have stood up with us and won it. They deserve a big congratulations for what they did. And they have probably done more to protect themselves in this act than all the US military equipment in the world. As I said al-Qaeda dare not send this Arab Muslim country of Iraq back into bloodshed. They cannot. Because if they did, this time it would literally be a noose around their necks. Contrary to what the US Congress, Democrat controlled, holds about Iraqis and the Iraqi people, how much they may feel compelled to Support our Troops but deride the courage and commitment of the Iraqi people, the Iraqi people have persevered. How about “The Iraqi People” as Time Persons of the Year? My hunch is that we’d see the same level of management of the Internet from the U.N. that we’ve seen when it came to peacekeeping operations in Africa. Or its management of Saddam Hussein’s “Oil for Food” program. Or its monitoring of Iran’s nuclear program. In fact, I wouldn’t be surprised if when you look up “fool’s errand” in the dictionary, you find: “Role for United Nations’” as the definition. The notion of surrendering management of the Internet – a global, strategic infrastructure for communications and commerce – to the UN is just a plain dumb idea. We shouldn’t be handing over something that works right to an institution that has difficulty doing anything right. If you want to sexual exploitation of enslaved women and children, racketeering both pedestrian and monstrous, or personal enrichment of Internationalist bureaucrats and their families, by all means, call the UN. If you want technical excellence and efficiency, better stick with high tech private industry, especially that still residing in large part in the US of A.
Michael Yon posts an absolutely must-read, must-see pictorial with commentary on the reopening of a Christian church in Baghdad. This is the same church newly adorned as depicted in that remarkable image, shown and discussed here. I know this hymn well, I learned it at Life’s Hope Baptist Church in Atlanta GA, during that blessed year my family lived among those who would become our dear friends. It was a year of great change, of awakening, of renewal and growth. New beginnings, new hope, Life’s Hope. With tears, not of bitterness, but of joy and relief, so we will be welcomed home. So too, perhaps, for the Iraqi Diaspora. My solution to this problem is to hit back twice in rapid succession, which usually pulls me back to where I came from. I’ve had this happen at Malkin’s site; the latest offender is Glenn Greenwald at Slate, so this traffic inflation technique knows no partisan bounds. Greyhawk gets lots of credit in my book for being the first to call it won, now that even the Associated Press and the NYT can’t ignore the signs of victory. But I digress. So I'm walking to the gym. Under my feet: four inches of gravel pave the way. Concrete t-wall sections form unbroken fortress walls on either side of my path. It's early in the morning, so the shadow of the wall on my left is shading that half of the road. A breeze is blowing, and in the shade in the moments just after dawn that breeze hits me in my shorts and t-shirt and chills me just enough that I take a few steps sideways and into the sun. And then it hit me - I'd been walking in the shade because that's what I - and everyone else here - had done throughout the 120 degree summer and on into the merely 90 degree days of early fall. And while the change has been gradual, it was only today that I noticed it, as I broke a time-worn habit and passed from the too-cool shadows into the glowing warmth of the morning desert sun. I remember walking on gravel more clearly than anything else. It is an attempt at firmness, controlling the uncontrollable. Every step shifts, there is more effort in every stride, and it wearies you the longer you walk on it. But it does allow forward motion, however aggravating and tiring. It beats the alternative of Iraqi clay that can become muck at those rare times of rain. I suppose. We who walked upon it will remember it always. I was happier to walk on honest asphalt than any other physical experience, back home. A fitting symbol of our service, our sacrifice, and yes, our victory in Iraq. That change of season, I remember, too. I wrote about it here, reprinted here. A faint stirring of excitement, perhaps unnoticed at the time. A moment of awakening, to be sure. An eye-blinking, sudden consciousness, after a too long season of numbness, walking slumber, a kind of deadening. Breeze brings hope. Like a mirror of what takes place throughout the barren landscape: the oppressive heat lifts, then cooler nights, and eventually a chill, cold rain, but just now only a harbinger of mission end. You wait so long for any change in season, that any change must mark a milestone. If I have to pick one quality that makes James Taranto an incredibly readable commentator, I’d say it’s the strength of his logic. On Thursday, he deployed that logic in devastating fashion against highly offensive comments by Senator Chris Dodd. Compare that case to the case of Khalid Sheikh Mohammed, who organized the attacks of 9/11. He was held in a secret prison, where he claims he was tortured severely. Whether he is lying or not, by our actions we have allowed Khalid Mohammed to claim the moral high ground. Khalid Mohammed plays martyr to a world that is inclined to believe it. Yes, assuredly, but does Dodd believe it? For some, by asking that, I leave myself open to immediate outrage in response, accusing me of questioning Dodd’s patriotism. I don’t question his patriotism, but his judgment. This is not an attack, but a question to probe the true intent of someone making such an assertion, an assertion that opponents of the President make repeatedly. This assertion is matched by a host of related assertions, about the standing of the US in the World, how we’re perceived, our government, as a nation, even as individuals. Dodd does not quite have the courage of his convictions in this matter. He does not actually make the primary assertion: that KSM is morally superior to USA. Rather, he relies on a secondary claim: that unspecified other people--"a world," presumably meaning Earth--are "inclined to believe it." Is even this secondary assertion true? Color us skeptical. Sure, a significant portion of the "world" is inclined to believe bad things about America. How much weight such opinions are due, both as a practical matter and as a moral one, is a legitimate topic for debate. But we don't recall ever hearing a serious person say that Khalid Sheikh Mohammed has the moral high ground vis-à-vis the U.S. Possibly our information is incomplete and someone actually has said such a thing. Doesn't Dodd agree that this is an outrageous slander? And if America is being slandered, doesn't Dodd, as an American political leader, have an obligation to set the record straight? Either Dodd is condoning the most vicious defamation of America or he is engaging in such defamation himself via a straw man. Whichever the case--and regardless of the merits of the policy under debate--his rhetoric is despicable. Even if one accepts on good faith the presumed intent of Dodd in making this argument, one can fault him on the attention he pays in world opinion, when it is factually wrong. Much like decision-making or leadership by polls, while it is often informative to see what others think, even a majority of others, it is morally and ethically wrong to use such “consensus” or opinions of others as a determinant for action. Unless of course, you share those views. And it isn’t questioning his patriotism to ask how thoroughly Dodd and other Democrats have thought through the logical chain of their arguments. By elevating the moral standing of our enemies most foul, partisan opponents burnish and enhance those enemies, and are part of the wrong-headedness and lack of perspective that allows the “world” to think wrongly, with an attendant suffering in our esteem. Glenn Reynolds posts a great round-up at Instapundit, cataloging a deluge of blog reactions to what many are already suggesting will become an iconic image for our efforts in Iraq. 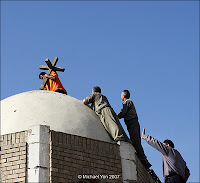 By now, everybody’s probably seen this photo by Michael Yon, showing Iraqi Muslims and Christians working together to restore a cross atop a Christian church in Baghdad. A Muslim man had invited the American soldiers from “Chosen” Company 2-12 Cavalry to the church, where I videotaped as Muslims and Christians worked and rejoiced at the reopening of St John’s, an occasion all viewed as a sign of hope. The Iraqis asked me to convey a message of thanks to the American people. ” Thank you, thank you,” the people were saying. One man said, “Thank you for peace.” Another man, a Muslim, said “All the people, all the people in Iraq, Muslim and Christian, is brother.” The men and women were holding bells, and for the first time in memory freedom rang over the ravaged land between two rivers. Some of us will discover that we have said or thought both things at one time or another. It’s not important which one of those people you are. It’s important, though, to get a sense of what is going on over there, where our people are serving, living and dying. It’s important to realize that where there is danger and tragedy, there is also progress and hope. In the major media outlets, we get big servings of the first two and very niggardly helpings of the latter. We need a more balanced diet of information.In truth, we know so little. So much of the information we get from Iraq is filtered and delivered from “safe” locations. So little of it is unfiltered and delivered from the Iraqi streets. Frankly, I don’t understand why so many mock us for wanting a future for Iraq. Is your hatred for George Bush so great that you prefer to see millions of civilians suffer just to prove him wrong? It really comes down to this: you are determined to see Iraq become a permanent hellhole because you hate Bush. And we are determined to see Iraq become a success, because we want to live. Doing his part to draw attention to the image of Iraqi perseverance, Chris Muir includes it in today’s Day by Day. The Washington Post today pulls back the curtain on one of the little-observed and lesser criticized inequities structurally embedded in the US tax code: high wage earning masquerading as capital investment earnings. Staff writer Jonathan Weisman’s report ostensibly gives background on a pending vote in the House on a bill designed to stave off the growth of the alternative minimum tax (AMT), offset by taxing the incomes of hedge fund and private equity managers as income, versus treating their incomes as earnings from capital gains. The measure has deeply divided Democrats, pitting a rank and file that has railed for years against inequities in the tax code against the party's money men, who are reluctant to bite the hand that has generously fed them. Hanging in the balance is the AMT, enacted in 1969 to ensure that the wealthiest Americans pay at least some taxes. Instead, it has increasingly affected middle-class taxpayers. "If you're a Democrat and you have to choose between the alternative minimum tax and the hedge fund industry, that's one tough ideological choice," said Viva Hammer, who recently left the Treasury Department's Office of Tax Policy and is now a tax partner at the law firm Crowell & Moring. "It's a choice between your votes and your wallet." By late July, Schumer was off the fence -- and on the side of the hedge funds and private-equity firms in opposing the Democratic legislation. Glad to see my Senator Schumer knows what constituency he’s serving. The legislation would plug two obscure but highly controversial tax loopholes, deftly exploited by an industry that leans heavily Democratic. Private-equity fund managers earn much of their compensation by taking a cut of clients' earnings. It is pay for work, but critics of the arrangement note that it is taxed as capital gains, at 15 percent instead of the 35 percent income tax rate that they would otherwise pay. Hammer said that about half of all private-equity compensation is taxed that way. About 20 percent of hedge fund compensation also is taxed at 15 percent, a rate lower than the one most secretaries pay. "It's one thing to allow such generous tax treatment to a small business or perhaps a real estate investment. It's quite another to apply it to a billion-dollar equity fund," said Victor Fleischer, a University of Illinois law professor who has highlighted the issue. Weisman also reports that the change in tax treatment of this income as income could bring in an additional $26 billion over the next decade. Hedge funds and investment firms have been pouring money into Washington, contributing $11.8 million in the first nine months of this year to candidates, party committees and leadership political action committees. That is more than the $11.3 million they gave in all of 2005 and 2006, according to the Center for Responsive Politics. More than two-thirds of that money has gone to Democrats. Absolutely outrageous: that this was ever the law of the land, and that Democrats, kowtowing to the moneyed interests they serve, are trying to close such an offensive loop hole in the tax code. All you progressives out there, who want to call the GOP the party of the rich and privileged, try to square that circle. Oh, and as you are writing that “Republicans have been doing that for years blah blah blah,” you’re either against Government corruption, pork, and graft, or you’re not. You can’t find it repulsive from one party and tolerable from another. We can all agree to throw all the bums out, too; works for me.